Today I welcome Victoria Jent of the popular perfume and beauty blog EauMG. 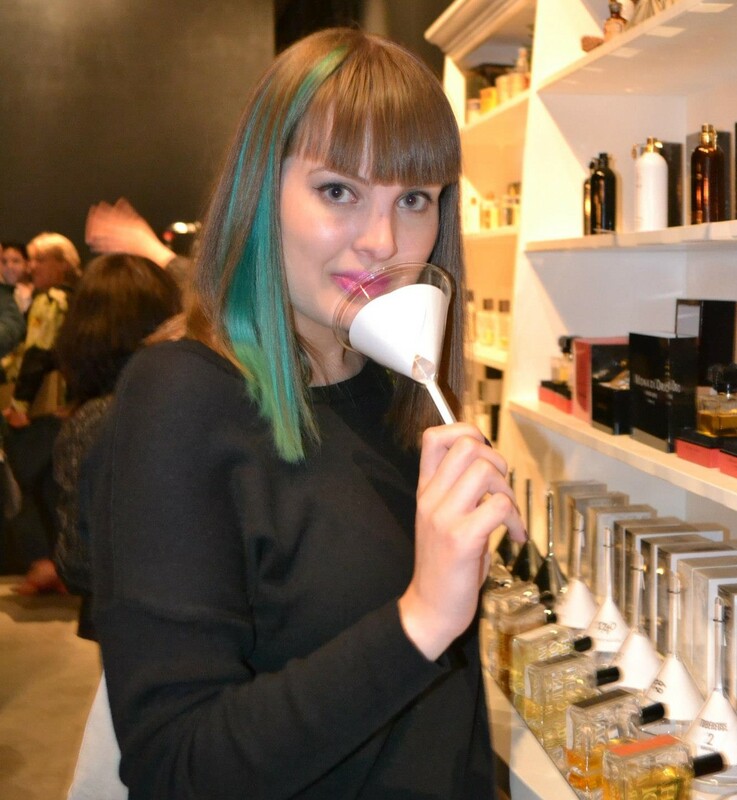 Victoria has been blogging for six years now, so she is a grey eminence among this young tribe of perfume writers. She writes concise reviews, often puts together fantastic gift guides for Mother’s Day, Christmas, you name it, and she never seems to tire, which is why I admire her immensely. It is was her birthday as well as her blog’s birthday yesterday, so my best wishes dear Victoria! Here’s to the next six years! A good day starts with... not being rushed. I’d never leave the house without… my druthers. I always feel good when… I’m spending time with those that I love. My favorite thing in the world is… eating. I love trying new foods, restaurants and cooking. The next thing I want to buy is… a leather gaucho hat. Don’t ask. Reference “personal style” below. The place I always come back to is… a state of existential crisis. My personal style is… reject Disney villainess. Dark, dramatic and too many animal prints. My favorite perfume…you can’t ask a perfume blogger that! I have too many favorites! When I travel I always … eat and drink too much. To relax I need… wine. When I have a bad day… I whine and drink wine. I like to gift people with… wine. And my lovely presence. But, they seem to appreciate the wine more. Something I would never want to miss… is an opportunity to satisfy my wanderlust. In my fridge there is always… sparkling wine. And fancy cheeses. You never know when you’ll need to celebrate! On my nightstand I keep… I actually don’t have a nightstand! Blame my current minimalist phase. The perfect weekend starts with… brunch with friends (after sleeping in as late as I want). My role model is… I don’t really feel I have one but if I have to name someone I would say RuPaul. Something I always want to be asked in questionnaires like this is… if you could be on any reality TV show, which would it be? And why? Are you an EauMG fan like me? This entry was posted in Interview and tagged Fragrance, Interview, Perfume. Bookmark the permalink. Great interview as always but what are druthers? Victoria, I love that RuPaul is your role model. Fabulous. One of my favorite bloggers!And a twitter-friend like you Birgit! !She put me on the path to obsessing and buying MONTALE dark Purple eventually!Hehe! I also think the name EauMG is pure genius and I follow Victoria’s blog. But what are druthers, indeed? Brilliant. I also admire Victoria. So funny (or perhaps not) B that I also resonated with the state existential crisis. Can’t imagine Victoria being in crisis though, she seems so together. Her love of Ru Paul makes sense given her regular tweets about the show Drag Race. Must watch. I guessed druthers were slang for “underpants” but we’ll see. Good idea about the druthers, it was my first idea too (until I googled it). OMG, I love Victoria and EauMG! 😀 She has such a great sense of humor and she often will slip something into her reviews – a very unique perspective or bit of social commentary that is great food for thought – but she does it so slyly and concisely that one could almost miss it. Genius! In your interview here, I particularly loved her reply to “Where I find my inspiration.” You can tell when you read her blog that she does indeed find inspiration in all of the places she mentions. I’m not surprised you love her blog too, Suz! Thanks for interviewing me Birgit! It was delightful. Thank you for being game to do this and for your explanations! Druthers is surely an interesting word. Too bad Drag Race is not on here in Austria, I’d love to see it. Love the answers and love Victoria and EauMG…you’re right, one of the best names out there! Glad you like it too, Steve! I’ve always enjoyed EauMG, but I will enjoy it even more now that I’ve “met” Victoria. I didn’t know what a fun and unique person she really is. Thanks for the interview. Glad you enjoyed it, Kandice! My mum used to use the word ‘druthers’ in the ‘if I had my…’ construction. And was also into ‘wither wringing’. Loved this quirky interview and V’s pithy answers – especially the druthers, the existential crisis, the wine (and whine!) and V’s refreshing lack of a night stand. ;). I should declutter more…! As always, I enjoy this series, Birgit! Eau MG is a favorite blog and Victoria’s sly, quirky sense of humor and honesty makes her writing a joy to read. If I had my druthers I’d sleep in as long as I wanted, too! My vote for funniest perfume blogger. Really love her and we also often like the same lipsticks.